The PHD Minim 500 is a stripped down lightweight minimalist sleeping bag. PHD Clothing has a reputation for producing uncompromising designs for maximum performance and the Minim 500 is the absolute epitome of this. It has been stripped of almost all extraneous features such as zips and a neck baffle; but retains high quality down (800 fill power) and lightweight fabrics to create a sub 1kg sleeping bag with a minimum temp rating of -10°C. Its lack of features continues with a simple oval foot piece and standard hood design. As PHD Clothing say of the lighter minimus it “is a single purpose down sleeping bag, effective warmth at the least possible weight”. This extreme approach to weight saving also results in reduced pack size. Many people have criticized the PHD Minim 500 sleeping bag for not achieving its -10°C minimum temperate rating. Whilst this is only a guideline figure, it is as a result of the weight/feature saving that the minimum temperature rating is hard to achieve. For example, the omission of a neck baffle means you have to be extremely fastidious to create an effective heat seal around your head and neck to trap heat in. This can be achieved with careful use of a jacket or tucking the sleeping bag in around your shoulders. Likewise the hood and foot piece do not fit as snugly as a more complex anatomical mummy hood or trapezoid/ovoid foot piece. Collectively these differences mean you have to work harder to get it to perform to its potential. One final note on the minimum temperature rating; whilst many factors contribute to this the warmth/insulation of your sleeping mat can be one of the largest differences. To achieve a comfort rating of -10°C you will need a sleeping mat capable of insulating you from the ground at these temperatures (R-value >3.5 as a rough guide). PHD Clothing offers the choice of outer fabrics across the Minim range; the Minim 500 being reviewed features a Drishell outer, this is a ripstop nylon with a ultra-light coating providing good water resistance. Whilst keeping a down sleeping bag dry is essential to maintain its performance, having a water resistant outer alleviates some of the anxiety of getting it wet, e.g. drips from a tent or snowhole can be easily brushed off. It also allows you to turn the sleeping bag inside out if you are damp but your surroundings are not; helping to keep the down dry and preserving its loft. Minimal features help to create a lightweight sleeping bag with small pack size. Drishell outer fabric helps to keep down dry and lofting. Omission of key features and simplicity of others mean you must work harder to get the most from the bag. Design and styling is not as cosmetically appealing as many other brands. Whilst only psychological, things which look better often perform better in the eyes of the user. 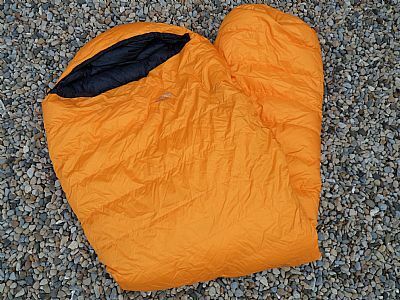 The PHD Minim 500 is an excellent lightweight down sleeping bag. Although a small weight penalty, the addition of a Drishell outer is highly recommended. However the user needs to be careful to ensure that they prevent as much heat as possible from escaping due to the lack of neck baffle and simplistic hood design if they are using it in colder conditions.